Our graduates remain in our hearts and minds long after they leave Metro Prep. They continue to amaze us and make us proud as they succeed in postsecondary studies and achieve greatness! Take a look below at our wonderful and ever-growing collection of assorted accomplishments from Metro Prep alumni. We also have full-featured Alumni Profiles with impressive academic, professional and lifetime highlights, not to mention a collection of talented Notable Grads! Would you like to add your very own profile or be a featured grad? Please keep in touch or reconnect with our Alumni Contact Update form and let us know what's happening! Canada's leading online lifestyle magazine for driven young professionals features a wonderful "Secrets Of The Biz" Q&A with Oliver Berg, Metro Prep class of 2008. A feature in The Globe and Mail shines the spotlight on Toronto furniture designer and Metro Prep alum Mischa Couvrette. If you missed the printed issue, you can read the full article online at https://tgam.ca/2g0JNdB. Metropolitan Preparatory Academy would like to congratulate our very own Diana De Santis on being the recipient of two Governor General’s Academic Medals. These medals are among the most prestigious awards that a student can receive in a Canadian educational institution. Diana was first awarded the Bronze Medal in 2011, honouring the highest level of achievement at the secondary school level (Metro Prep Academy). In 2015, she was awarded the Silver Medal in recognition of her outstanding achievement at the undergraduate level (University of Guelph). Diana is now completing her first year of medical school at the renowned McMaster University. IN THE MOMENT is an immersive, interactive, sensory experience that allows viewers to relive concerts by Canadian and international artists. The collective are artists that all enjoy the experience of live events. With the evolution of media, we look to break the boundaries of experience. 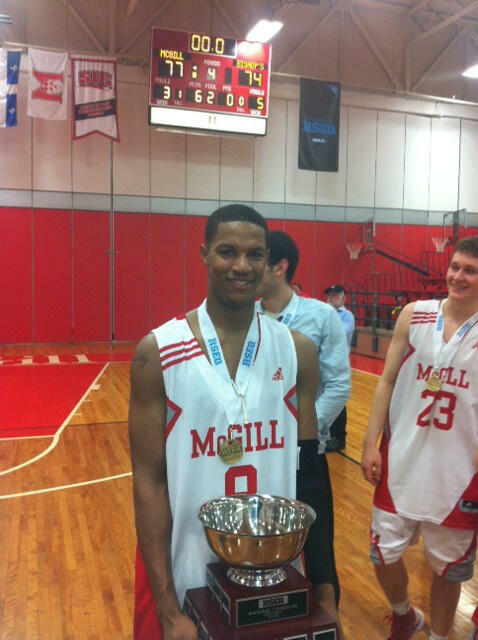 Metro Prep alumni Te'jour Riley helped McGill University win their first Quebec championship since 1986! "It was McGill's 21st conference title overall but their first since 1986, when they advanced to a CIS regional tournament. The Redmen are scheduled to depart on Wednesday for the CIS Final Eight in Ottawa, March 6-10. It will be their first appearance at the CIS national tourney since 1979 and they will be bidding for their first-ever national title. Combined with the McGill Martlets 51-48 home-court victory over Concordia in the Quebec women's final earlier in the day, it marked the second time in school history that both McGill basketball teams had won a conference title in the same season, the other occurrence happening in 1985-86." Continue reading the full story from McGill Athletics.